Here's one of the two "elixers of life" for chile lovers...the other being basic Red Chile Sauce. 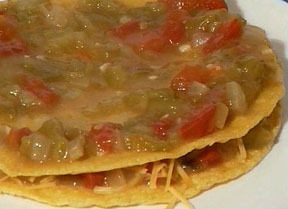 Together these two basic sauces constitute the main ingredient of most chile dishes (Green Chile Enchiladas shown below). We think of these two sauces as the "Yin and Yang" of chile cooking. Heat the oil and saute the onion a few minutes, then add the garlic and cook until softened. Stir in the flour, cook two minutes, then slowly add the stock. Add the chile, tomato, and cumin. Cover and simmer at least 30 minutes, stirring occasionally. Add water or stock if sauce gets too thick. Now that you've made this great sauce, learn how to use it in some great dishes! Get our "Tale of Two Chiles" cookbook and how-to video. It has all the information you need to start cooking New Mexico chile dishes like a native!